Beware of those that tell you to BEWARE. “Beware of Those” by Suzy Kassem, Copyright 2009. All Rights Reserved. Also found in the book ‘Rise Up and Salute the Sun’ 2010.
Who feel smaller than them. A lion does not flinch at laughter coming from a hyena. A gorilla does not budge from a banana thrown at it by a monkey. at the intrusion of an annoying woodpecker. 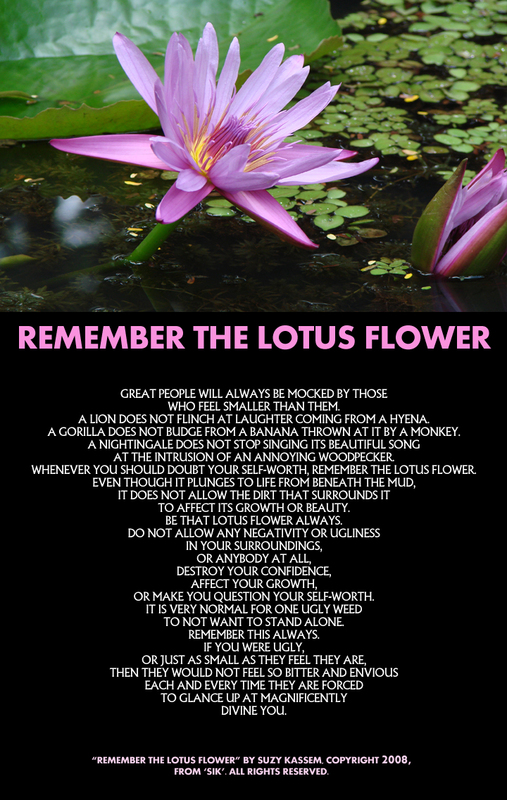 Whenever you should doubt your self-worth, remember the lotus flower. To affect its growth or beauty. Be that lotus flower always. Or make you question your self-worth. to not want to stand alone. Copyright 2008, Suzy Kassem. All rights reserved. A great emperor is born from one tiny sperm. 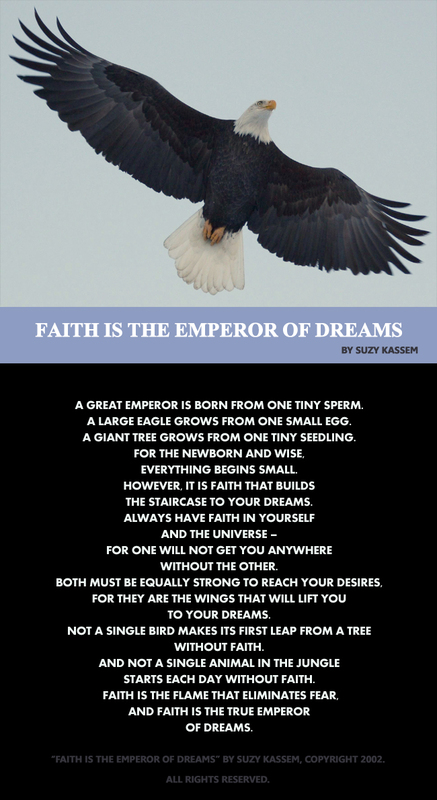 A large eagle grows from one small egg. A giant tree grows from one tiny seedling. The staircase to your dreams. 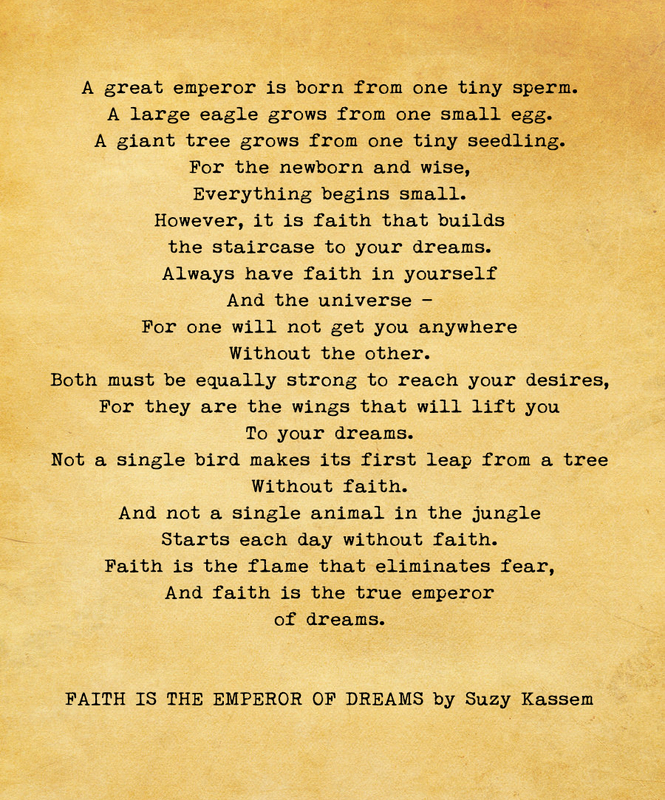 Not a single bird makes its first leap From a tree without faith. Starts each day without faith. Copyright 2002, Suzy Kassem. All rights reserved.